"To a person uninstructed in natural history, his country or sea-side stroll is a walk through a gallery filled with wonderful works of art, nine-tenths of which have their faces turned to the wall." 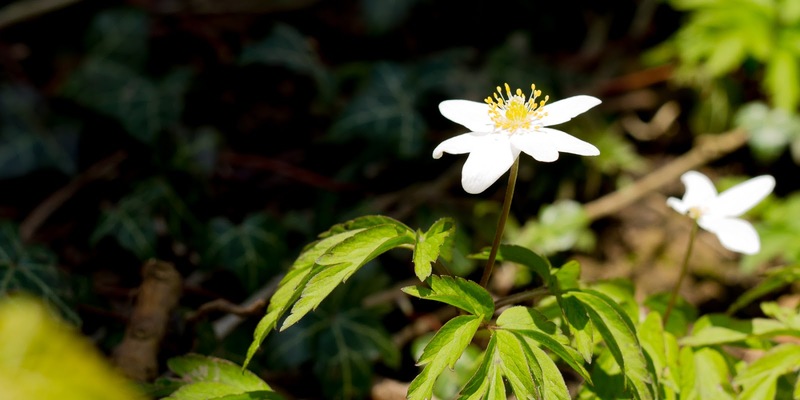 The first months of spring are good for the amateur botanist; there are only a handful of species of flower on show and it's a rewarding exercise to learn them all and in what order (roughly) they emerge. Any unidentified blooms can be quickly looked up in a book and added to the mental 'photoguide' and hence each year it gets later and later before the diversity overwhelms the ability to learn any more. 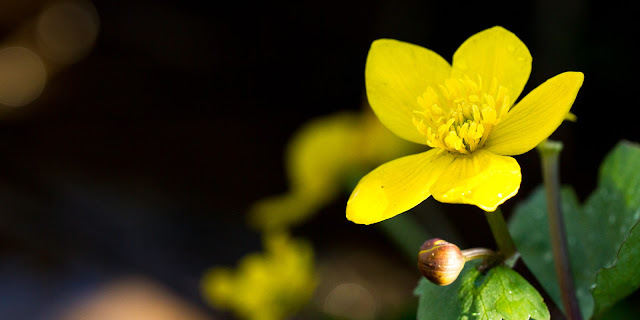 Marsh marigold has been around for just a week or so and yet already it is dirty and tattered; the victim of endeavouring bees. 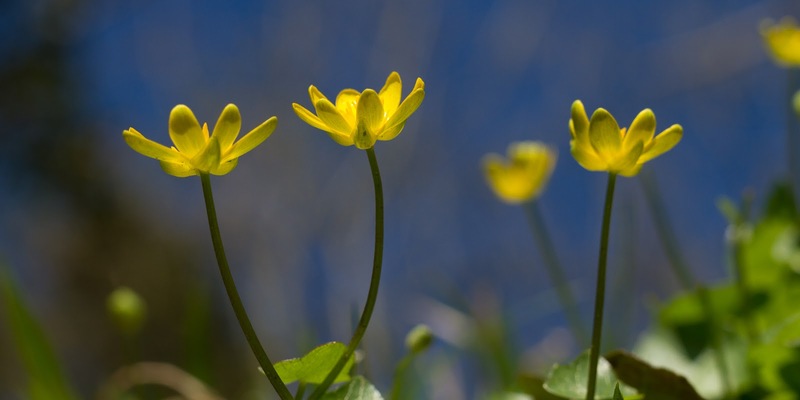 Indeed, it's bright yellow petals must shine like a beacon in the dark, brown mud of the wooded swamp where it grows, drawing in bees from afar. 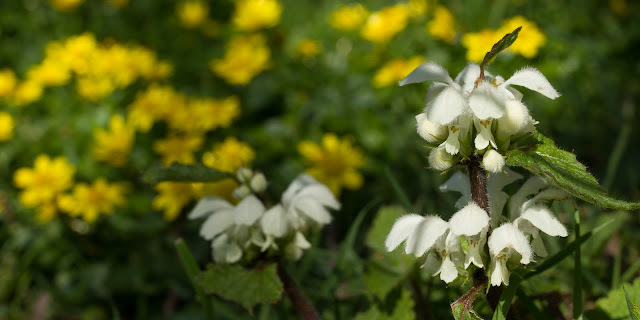 As mentioned in a previous flower post, the flowers seem to move through a spectrum: yellow, through white then purple before the landscape explodes in a kaleidoscopic array of colours from which no sense or order can be derived. Here in this corner of North Yorkshire, yellow is still very much the colour with lesser celandine in its pomp. However, the whites are on their way. Spikes of ramsons break through their broad, plasticky leaves but tease beneath their protective, green sepals. One or two have opened pathetically, disfigured and isolated. In just a few days they will all be in flower and the wood will look completely different. In the meanwhile, white dead nettle and the first wood anemones can be found among the yellow. As I walked through the wood today I considered the quote from Huxley (above) and "Common Ground" by Rob Cowen. In one chapter, the author describes encountering detailed notes from another amateur naturalist that used to keep watch over his current patch. He contemplates whether he should be recording everything in minute detail; every flower, every fly, every spider, or whether it's enough to capture the essence of a place. The wood today was buzzing with bees, flies and beetles I couldn't identify. I became aware of just how little I know, of how many artworks were turned to the wall. And while this bothers me, the thought of sitting down and collecting, identifying and recording every single species troubles me more. My love of nature started like this and was necessary to understand the general order of nature, to gain an understanding of who was who such that I could enjoy it. This basic knowledge adds characters to the stories I watch unfold. I'm sure that's why I love nature; to find my own story played out once and only to me; a one-time, exclusive show. The characters can be familiar or strange, but I can place them in the personal set and story of my natural world. I share my own experiences and read about others', all the while colouring the back-stories of familiar characters and introducing new ones. 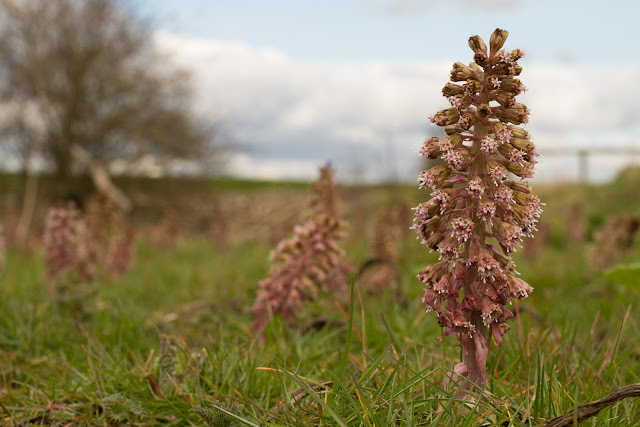 Butterbur. While I suppose I've always been aware of them, I'd never really had reason to find out what they are, but the sheer number of them was cause for interest. Apparently, when the flowers die back in late Spring they give way to leaves that can grow to one metre in diameter! I can't wait to see that! 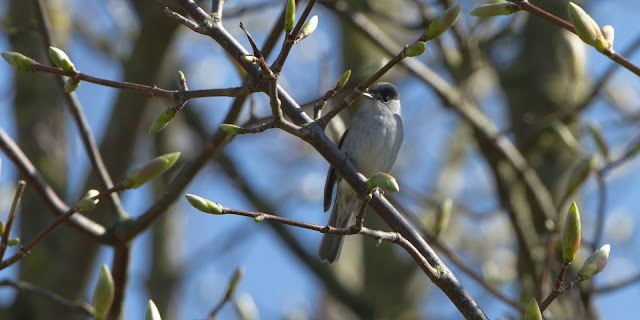 Despite the fantastic weather, today was very quiet with just one notable arrival: blackcaps seem to be have settled en masse. I counted at least 6 singing males along the length of my patch and spied a skulking red-capped female too.